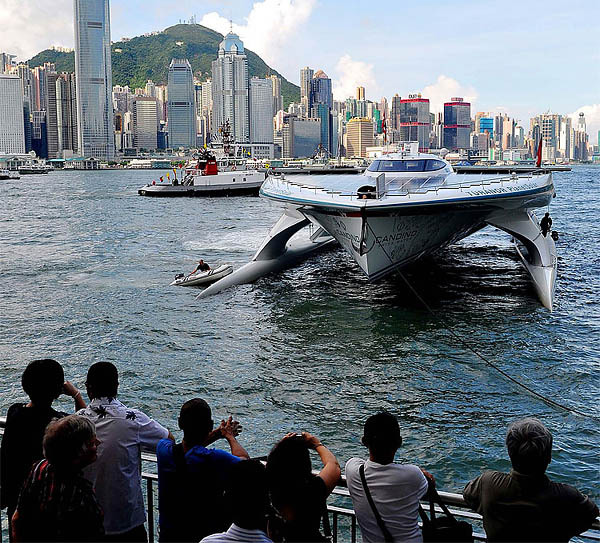 MS Tûranor PlanetSolar is the largest solar-powered boat in the world. NEW YORK: The world's largest fully solar-powered boat, Turanor PlanetSolar, docked in New York on June18, 2013 during a mission to study the effects of climate change on the Gulf Stream current. Sponsored in part by the Swiss government, the 35-metre (115-foot) catamaran is crowned with solar panels that retract in port but open like a bird's wings to take best advantage of the sun's rays when at sea. Weighing in at 90 tonnes, it travels at an average five knots. The ship set sail from La Ciotat in France just over two months ago. And since it has made stops including the southeastern US city of Miami on its information gathering mission on climate change and the Gulf current. "I myself live in Brittany, west of France, and we are very worried. We all know that if the Gulf Stream changes, even a little bit, our climate will deteriorate quiet a lot." - Gerard d'Aboville, the boat's French captain.